Last week I got a new pair of shoes for the studio. In a way it seems kind of silly to need something special for my feet but then I think of Mr. Rogers and his sneakers (and Ed Karr in his studio in Boston). Here's my reason: I work at my computer standing up and I have an anti-fatigue mat to stand on. It is most comfortable barefoot or in socks. However when I leave the mat, the floor is often cold. So I need to go from shoe to no shoe easily. In my clogs, I stand too high in front of the screen and my slipper/toe-thong sandals are to hard wear with socks. These are a perfect solution. The strap can adjust size for barefoot or socks and as an extra bonus, I get a foot massage as I walk around the studio. And the color makes them hard to lose. It is 11pm here in Chicago and of course I check to see what Sunday Studio thought you might want to share with us. Love the shoes. Standing desk! Wow, I thought: Susan is getting in activity wherever she can. 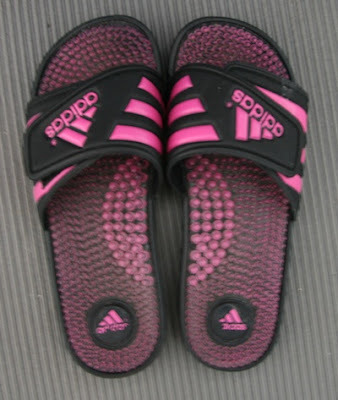 I bought these same sandals for my daughter. Neither of us usually chooses pink, but these just made us happy. Enjoy!